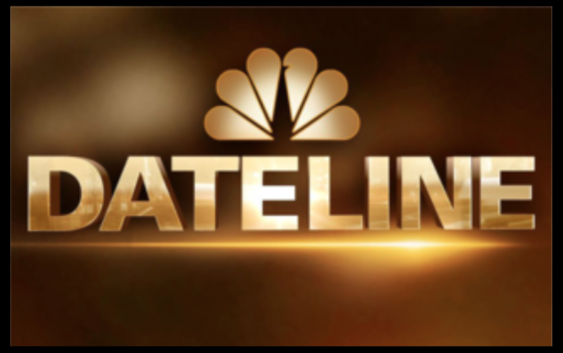 When I think of "Dateline" my mind immediately goes to the news. I wonder if the term has been used throughout modern journalism or if it's a more modern creation, like with Dateline NBC. I picture in my mind a reporter in some distant land saying, "dateline so and so, I'm standing outside some remote place doing something...". NBC's Dateline program premiered in March of 1992, so it's been around for a while but no where near as long as Hamilton's use of the name. 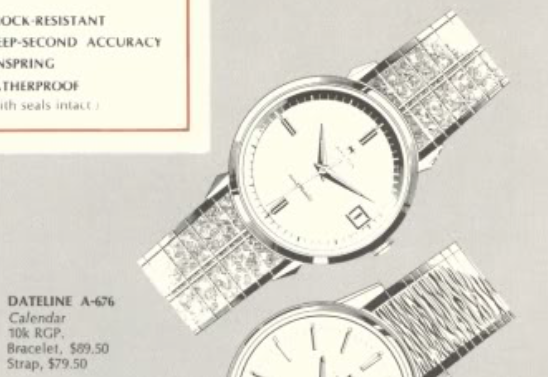 The Dateline series of calendar models was introduced in 1963 and included automatic as well as manual winding models. There were calendar models before the Dateline series and it appears the Dateline series absorbed all of the various calendar models, whether in the Accumatic line or the Thin-o-matic line. They were all part of one big happy Dateline family. The A-series of Datelines typically has ETA-based automatic movements and the TM-series has the Buren-based movements. The came in all of the case materials ranging from solid 14K gold through stainless steel and 10K rolled gold plated models. One of the 1965 Dateline models was the Dateline A-676. It was produced through 1967. Since the A-676 is part of the 600-nomenclature, it has a 10K rolled gold plated case. It came on a strap or on bracelet that was specifically chosen for the model. The dial on the A-676 looks familiar and it appears to have been used on other higher end models like the A-275 and A-475. My project watch arrived in nice overall condition. The dial has a very clean design with hour markers at the 12, 6 and 9 positions and the date window at 3. There's a bright silver chapter ring that surrounds the dial and it's hard to tell from the outside if it's integral to the dial or if it's a separate piece. The hands are a luminous dauphine style and are lumed with tritium paint - hence the T-SWISS-T at the bottom of the dial. The case is a one-piece design and the deep pie-pan shape is a clear sign that this case contains an ETA movement, probably the 694 or 694A. With the crystal out of the way you can see the dial is near-flawless. The silver ring actually fills up a lot of the case and helps to hold the dial and movement in place. The reflector ring lifts out easily and makes identifying the joint in the two piece stem a breeze. I just have to turn the stem so I can see the joint and then I can lift the movement out. Here's a shot of the female side of the stem that is retained in the movement. This side grasps the male portion that is in the crown. This movement is a 694 grade. It's basically the same as a 694A. I'm not sure what the difference between the two grades is but I suspect it's the shock jewels that were used. All the parts are separated in order to be thoroughly cleaned. The calendar complication adds a lot of tiny parts to keep track of and almost doubles the assembly time required. First I get the movement back in running order. The balance is swinging away with good motion but the timer will reveal how well it's truly running. Something inside is making extraneous noise. I could be a tiny spec of dust or lint somewhere on the balance, hairspring or pallet fork. It took some investigation to find the culprit of the noise (a piece of lint on the pallet fork) and after some tweaking of the balance the specs for the watch are greatly improved. A fresh lizard strap is all that I added to the outside of the watch. A quick polish of the case and the crystal bring everything back to a shiny appearance and this A-676 now looks a good as it runs. I'll be following the same steps to clean the watch (except perhaps doing anything to the movement. I am not there skills + tools wise). One thing I noticed that is different on my watch is that "T"s around the "Swiss" marking at 6 o'clock are missing. What could this mean? I couldn't find anything on that online, and it feels strange that Hamilton would make some lume with tritium and some not for the same model. Also, is the minute hand slightly curved on your watch as well? I don't know why your dial is missing the T's but I wouldn't worry about it. Getting the movement overhauled is always a good idea with a used watch - unless you know it's recently serviced. The hand may look slightly curved in the photo because it's actually moving and just frozen in the picture. I have a similar but not identical watch and cant find any others quite like it, do you have any suggestions. finding the ref no has been hard as I think the case back has been replaced. is ther anything you would suggest ?